New York is the 2nd largest employer of Rutgers Law School-Newark graduates. Distance and logistics often prevent Alumni who live or work in New York City from attending events held in New Jersey. However, many such alumni want to be active participants of the Alumni Association and to maintain ties with their colleagues from the People’s Electric Law School. To answer this demand, the current President of the Newark Alumni Association, Maritza Rodriguez and the Immediate Past President, Brian Biglin, in discussion with Co-Dean David Lopez, created the NYC Chapter. 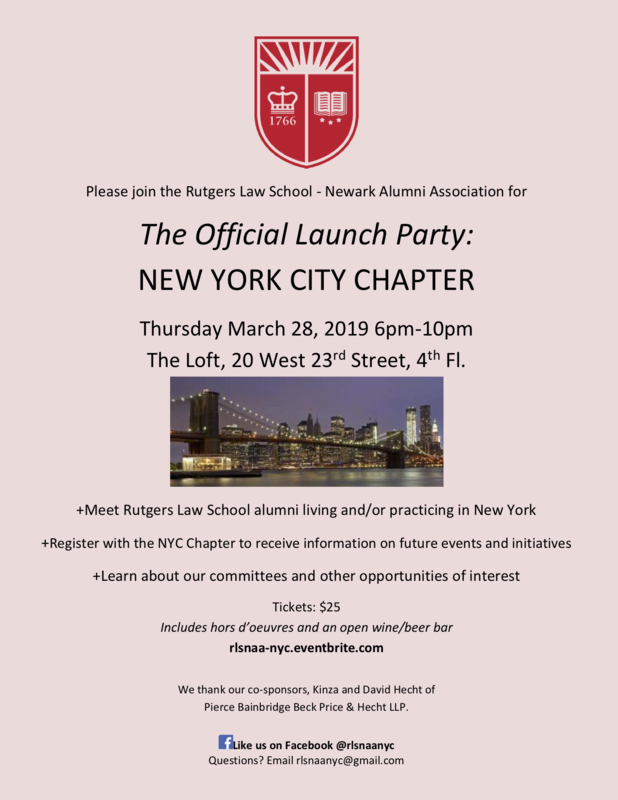 To strengthen relationships among alumni who live and/or work in New York City and to strengthen relationships between those alumni and the community of Rutgers School of Law-Newark, and to advance the ideals, reputation, and educational goals of the School.